The Austonian Condos | Search Austonian Condos For Sale! With 56 floors towering mightily above downtown Austin and a zenith that features a shining crown kissing the sky, The Austonian spells a new definition of Austin living – elite and hi-tech. Located on the intersection of Congress Avenue and 2nd Street. 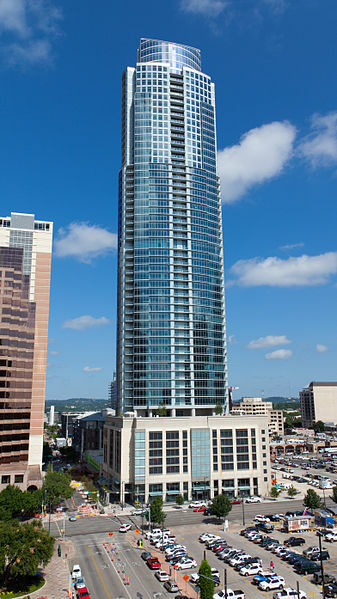 The Austonian Condos in Austin Tx are centrally located amongst more than a hundred restaurants and nightclubs, and a handful of cultural attractions that completes a multi-cultural community ensemble. One of the tower’s delightful views is the Lady Bird Lake, which also provides perfect venue for health and fitness activities like running and walking. All 188 well-furnished units that make up the elliptical tower provide an array of individual choices and exhibits commendable features of the latest technology in interior design and advanced landscape architecture that only the Austonian can offer, this condo building is among the finest of Downtown Austin Condos.The Austonian prices range from $500k and peak at $7 million. Check out the current Austonian condos for sale. Interiors bear classic style with hardwood floors, marble baths, stone counter-tops, 10-foot ceilings, solar shades, balconies, Italian cabinets and appliances Units are also pre-wired for stereo speakers with surround sound in the living room and each home has available wired and wireless internet connection. The Austonian boasts of high technology which includes one touch screen control for room temperature, lighting, telephone, security systems, music and movies. The touch screen system can also be used to notify the valet to get your car ready, receive alerts on guests, housekeeping and maintenance reports, schedule the control of lights and room climate, make reservations to all of The Austonian amenities, and even more possibilities. A complete set of amenities are available to residents which includes a 24/7 concierge and valet service for residents and their guests, secured access on high-speed elevators and a spacious lobby with topnotch finish. “The Lawn”, is found on the exterior of the 10th floor and offers 12,000 square feet of backyard, a 75-foot pool with fountains and in-water sitting area, hot tub, wide dog park, reflecting pool, luxury cabanas with flat screen televisions, outdoor kitchens and sunset viewing terraces, among many others. Meanwhile, the interior extravagantly provides theater viewing with 12 seating, spa treatment rooms and billiard and game room. A media room with draper 133-inch HDTV viewing screen is also available for entertainment enthusiasts. *photo courtesy of Wikipedia; Shawn Bell.